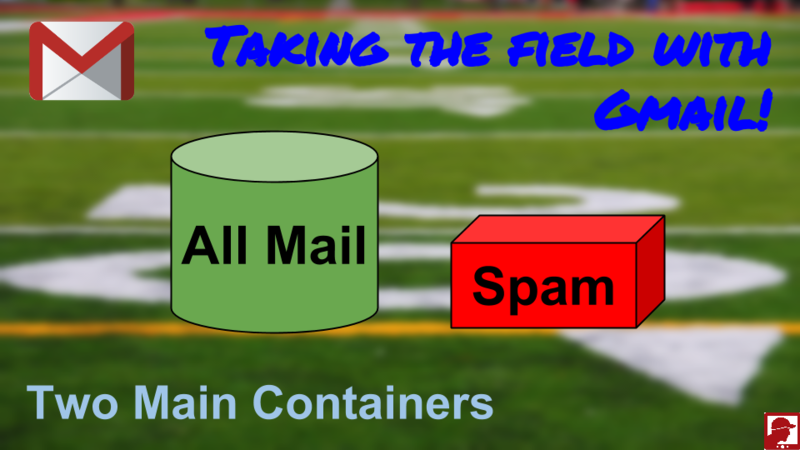 Taking the field with Gmail #1: Understand the playing field if you want to dominate! I’ve been getting some basic questions recently on using Gmail, so this is the first in a series I’m calling “Taking the field with Gmail”. As when mapping out any game strategy it is important to understand the field on which you play. Without that, the further you get into the advanced bits of the game, the easier it is to get confused and drop the ball. Gmail is easy to use, why does it need so much attention? If you only deal with a couple personal emails a day, then you're right. You can simply read and reply to emails as they come in and leave them hanging out in your inbox. If however, you are dealing with even as few as a dozen emails a day that are across various aspects of your life such as: family, work, school, church, social networks, online shopping shipping tracking and receipts, etc., etc. ; now you've got a challenge! To put it in cold technical terms, you have a data management problem. Fortunately, sifting, managing, storing and searching massive amounts of data is something Google is extremely good at! Gmail is a powerful and popular tool, but with such a feature rich tool can come a lot of confusion about how it really works. We’re going to take this step by step in short videos and accompanying blog posts, starting with this one! This first installment will cover the basics of the All Mail and Spam containers. Later installments will cover Labels in Gmail vs. Folders with which you may be familiar from other email programs. We’ll then get into filtering emails and choosing between the different organizational schemes Gmail provides to help manage your email overload. All email is initially filtered into two main containers: All Mail and Spam. Google takes the liberty of doing an initial filtering of your email trying to keep you away from merely obnoxious to the seriously insecure email bouncing around out there. Email that is not deemed as Spam is given also given the label, Inbox, which as you'd guess, is what shows up in your inbox. Think of Inbox as a subcontainer or subset of the All Mail container superset. When you Archive an email, the label Inbox is removed, but the email is still in All Mail, which you can view from the left hand label list in Gmail. (this is the list which has Inbox as the top item (Label). When you Delete an email, the label Inbox is removed (disappears from your Inbox view), given the Trash label. You can view Trash from the left hand label list. That email is still also in All Mail container. Trash is a special container in that it actually removes the email (after 30 days) completely from All Mail at which point it actually and truly "gone" from your Gmail. To make sense of all the tech jargon above, watch the video as we walk through the Gmail interface to demonstrate this simple, two-container approach as well as a discussion on where email "goes" when you Archive it. Next installment, we'll get into Labels, trash talk more about Categories (you watched the video here, right?). Labels are a finesse part of our Gmail game plan. Easy to get started with, then turn to devastatingly productive benefit combined with solid Filtering footwork! Next installment, Game Plan #2: Hit Labels Hard!